2011 looks to be a very busy year for Queen and there is a special reason behind it: the group is celebrating its 40th anniversary. 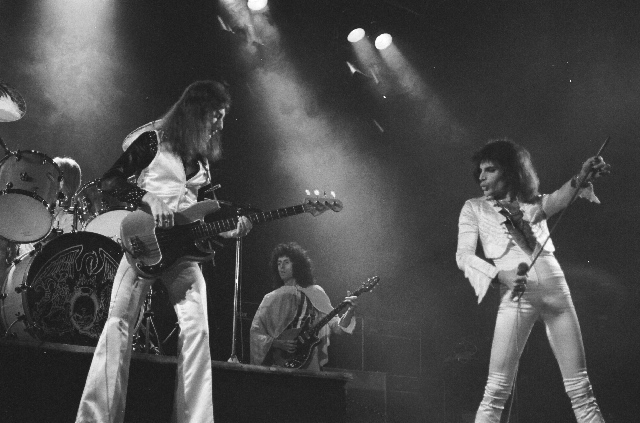 So far, the festivities began with the reissue of the band’s first five albums — ‘Queen,’ ‘Queen II,’ ‘Sheer Heart Attack,’ ‘A Night At the Opera’ and ‘A Day at the Races’ (they will be rereleased in the US May 17); and a London exhibit, ‘Stormtroopers in Stilettos,’ which spotlighted Queen’s early-to-mid-’70s period. Another release in the midst of the anniversary is a new unofficial biography on the band, ‘Is This the Real Life? : The Untold Story of Queen,’ by Mark Blake. It covers the group’s entire history from late singer Freddie Mercury’s childhood, which included a boarding school experience in India, to current members Brian May and Roger Taylor reforming Queen with Bad Company singer Paul Rodgers. In between are stories of of the group’s glory years that included the successes of ‘Bohemian Rhapsody’ and ‘Another One Bites the Dust,’ their extraordinary appearance at Live Aid and Mercury’s death from AIDS in 1991. As for what the group may do in the future, the author says that May and Taylor could rekindle the Queen spark in one-off situations, such as a TV special and charity gigs with perhaps guest vocalists. “I wouldn’t expect them to retire completely any time soon,” he says.